Remember that used dresser I found in a thrift store for $35. Well, it’s had a bit of money invested ($100 on knobs alone. Eek!) and time invested ( only a couple of hours) and it looks cute as a vintage button now that it’s all done. I am IN LOVE with how this turned out. It’s the perfect piece for my little girl’s room and it will have a long and happy life there. Once I decided to paint, it really wasn’t a difficult process. I used a little palm sander to rough up the finish and to soften some of the damage that was on the drawer fronts and top. There isn’t any need to remove all the old finish but the better job you do of prepping the surface for paint, the nicer the end result will be. I also did a good once over on the structure and tapped in any popped nails. The whole piece was painted in a durable mid sheen white. 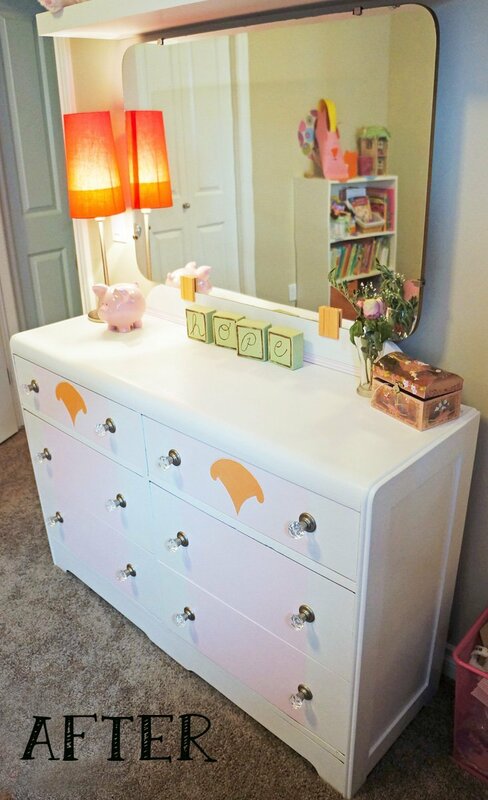 It is a touch hard to see in the photos but the center of the drawers are light pink and then we picked a sweet orange for the petal motif and mirror accent. Here you can see the pink a bit better. We chose it because my girl is a girly girl and wanted to paint the entire thing pink. By only doing it on the drawers, it will be easy to cover up in white or another color if/when she decides she’s too old for baby pink. I went a bit overboard on replacing the knobs. I choose these crystal numbers I found at the hardware store. I think they add a touch of glam and whimsy – they make the piece. Once I saw them I had to get them….to the tune of $100. Oops. When choosing new knobs, take one of the old ones with you so you can match up holes. In my case, I needed to drill new holes so I measured and marked carefully where I needed them before drilling. I also needed to choose a knob that would cover the old holes and these ones barely worked, thank goodness. My biggest tip when painting anything is to utilize the knowledge of the person behind the paint counter. Show them a photo of the piece you are going to paint. They will help you pick a primer suitable to the job. DO NOT SKIP PRIMER. Did you hear me? Don’t. Also tell the person at the paint desk how the piece will be used. Which room? By who? Does it need to be really durable and washable? Or will it sit in a corner and rarely be touched? They will help you pick a paint that will work for you. It’s really not that hard and you know what? It’s just paint. If you don’t like the color or need to change it a few years down the road it’s no big deal. Paint it again! *says the girl who would paint every piece in her house if she had the time* Have you painted anything recently? I’d love to hear about it! I LOVE the way it turned out. 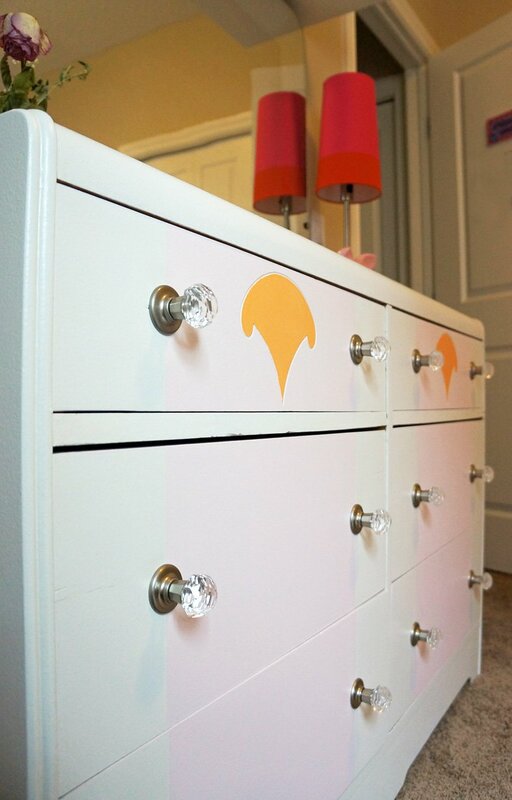 The color combo is darling and I like that you painted the drawers pink so it will be easy to change. 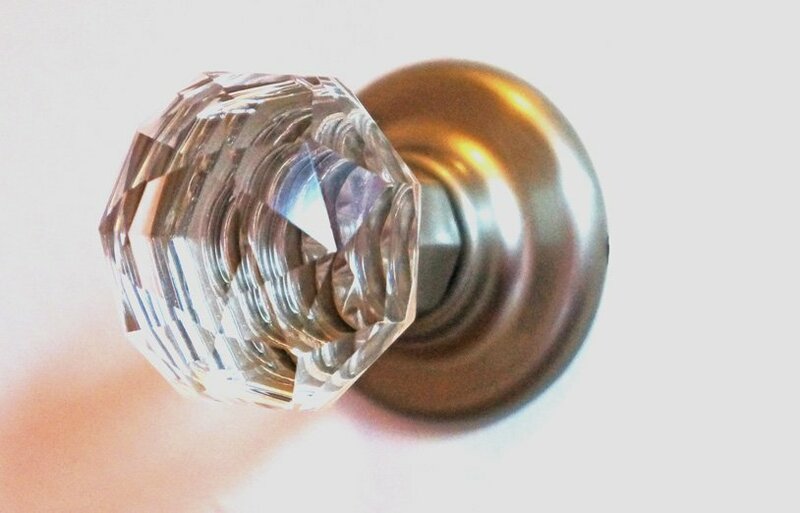 I love those crystal knobs too and have some similar ones in Bella’s room. Next time you are looking for knobs, check e-bay. Bella’s crystal knobs came from e-bay & cost 1/2 what I was looking at paying at Lowes! They are much nicer than the more expensive ones were too. That’s a good tip. I’m so bad at online shopping – I need to see stuff in person! It looks awesome Heather, but lordy those were some expensive knobs! I know….I sort of forgot I needed two per drawer. Great job! I need to do more refinishing. I love antiques but we got in the buy new habit. I need a few funky pieces for our new house. my problem with new is that unless you spend mucho casho, you’re left with something that’s pressboard and falls apart. I hate throwing $$ down the drain on buying garbage and I’m too cheap to shell out a grand for a dresser for my 5 year old! 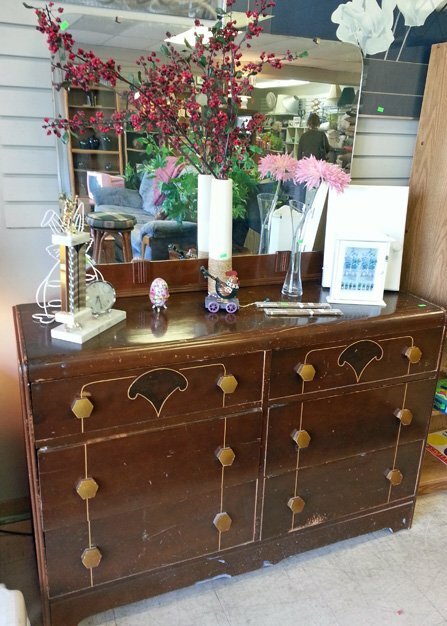 A used dresser was our answer here. Wow, what a great and helpful post! I’m terrible for picking up old furniture and putting it in the garage to refinish some day… maybe this will get me to actually do it! What a gorgeous makeover!! And those knobs were totally worth it, in my opinion. You have such a beautiful blog; I’m glad I found you. I agree – they were worth it. Thank you! Love it! That turned out super cute and those knobs – gorgeous!! It looks so fantastic. Love those knobs- definitely worth the splurge! It looks lovely! Perfect for a little girl’s room. And those knobs…wow, they are gorgeous…worth every penny! Amazing! Such a great transformation! Love the colors you used! And wow you got it done fast. Those knobs are the greatest things I’ve ever seen, good choice. I’m with ya on the primer….important. I’ve skipped it before out of sheer laziness and have paid the price. The dresser turned out beautiful. This turned out beautifully, and I am sure your daughter is going to enjoy it for a very long time. A great update. That was some nice doggy damage! but, you can’t even tell. I love the knobs you went with. I used similar ones on a side table I did last year (http://moorofeverything.com/where-we-were). So pretty! You are inspiring Heather. I’m ready to hit the vintage store tomorrow. I so wish I had your eye and could see past the visual. That is a gorgeous piece. Fantastic job. That looks great! I’m in awe of anyone who can do stuff like this. No way I’d even attempt it. That looks great! Right now Gavin has an old dresser of Murray’s. It’s in great shape, but I wouldn’t mind freshening it up a bit. This makes me hopeful that I could do it without screwing it up too badly. Awesome advice, I usually forget to ask for the experts help… learning to paint like a pro is on my bucket list! Looks like you’re there already! Lovely! I think all of your points are very good. I have a question regarding an old dresser that I have. It is an old Oak Canadiana piece that someone replaced two doors on it with two pine drawers. It is no longer authentic and I would love to paint it. I doubt very much that it is worth anything and I wouldn’t be interested in selling it anyway. Do you have any thoughts regarding this type of thing? Hi Cindy – I say, if you can give the piece new life and if you will use it and enjoy it then go ahead and paint it. If it was in perfect original condition I might say not to paint it, but since it isn’t, go for it! Thank you Heather! I appreciate your opinion on this and I think I just might do that! I would LOVE to see photos when you’re done! I think you made the right decision to paint it and it looks great! I have an old dresser and chest from my grandmother that I painted aqua and distressed. It turned out great! I never plan to sell it so I wanted to paint it to fit into my décor and it is beautiful. Please don’t ever paint any Broyhill Brasilia furniture! I got a Broyhill Brasilia china cabinet at Goodwill for $25. Thank goodness I checked into what I bought before I got that first coat on! It’s worth somewhere around $600. So just make sure what you have first before you go and paint it. Most MCM groups are a lot of help!